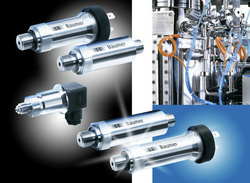 PB Series - Maximum Flexibility due to Modularity With the PB series, Baumer is introducing a new pressure transmitter family based on a modular system which can be adjusted individually to customers' needs. Remarkable is the high accuracy (of up to 0.1 % F.S.) over a large compensated temperature range of -40 °C up to +85 °C. The pressure range is between 100 mbar and 1600 bar. The FlexProgrammer 9701 enables the transmitter's easy configuration. Four different sensor technologies (capacitive ceramic, silicon piezo, thin film or ceramic thick film) as well as a wide range of industrial process and electrical connections are provided. The PB pressure transmitters offer high accuracy, even in demanding outdoor applications like in hydraulic and pneumatic, water treatment or the chemical industry. The measuring cells are characterised by excellent long-term stability and outstanding measuring performance in terms of linearity and hysteresis. With the highest possible accuracy class, the total error band is just ±0.4 % F.S. over the whole compensated temperature range. Mounted in a robust stainless steel housing, the pressure sensors have a high resistance against shocks, vibrations and overpressure. Therefore, the PB series is very reliable for applications in harsh environments. The ceramic or fully welded metal measuring cells guarantee a high resistance to corrosive chemicals or abrasive fluids. Options with ATEX or SIL2 approval allow installations in safety-critical and hazardous area applications.